This Samyang 16mm lens is in great physical and working condition. This lens has been well looked after, showing only very minor signs of previous use. Includes a lens hood and original packaging. 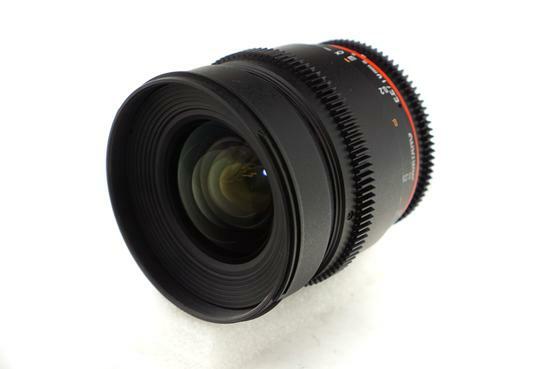 Samyang Optics 16mm T2.2 VDLSR ED AS UMC CS II is a wide angle manual focus cine lens designed for APS-C sensor sizes. Samyang 16mm T2.2 VDLSR ED AS UMC CS II is carefully designed for professional film and video works in APS-C sensor sizes. The focus gear ring is installed for professional follow focus system. You may change the aperture quietly and smoothly with the uncoupled aperture gear ring. The T number guiding the actual amount of light transmission and distance scales are marked on both sides of the lens to film much precisely. The lens operates in manual aperture system with low T number which enables natural shooting under various light exposure circumstances. This lens features 13 lenses in 11 groups including 1 hybrid aspherical lens (H-ASP), 1 glass aspherical lens (ASP) and 1 extra low dispersion lenses (ED). H-ASP and ASP lenses minimize color aberration to realize exceptional image quality and high contrast for center and corner of image even when aperture is fully opened. ED lens of 16mm T2.2 II effectively controls the light dispersion to prevent flare and ghost. Ultra Multi Coating (UMC) technology of Samyang Optics optimizes the light penetration to also minimize flare and ghost. The frame of Samyang 16mm T2.2 II is compact and solid since it is made of high-strength aluminum alloy so trustworthy images can be captured even under inferior environment. Also, detachable petal-shaped lens hood shelter the lens from unnecessary lights. Available for 10 camera mounts: Canon, Canon-M, Nikon, Pentax, Sony ∝, Sony-E, Four-Thirds, MFT, Samsung NX, and Fujifilm-X. Samyang 16mm T2.2 II is one of Samyang Optics VDSLR lens line for APS-C image sensor size. The lenses produce the same image color and have a united location of aperture and focus gear ring to maximize the convenience when filming. It minimizes color aberration to realize exceptional image quality and high contrast for center and corner of image even when aperture is fully opened. Extra low dispersion lens reduces chromatic aberration effectively to produce excellent image quality.